Christmas is always a magical time, particularly for the kids, but to experience a white Christmas in a beautiful mountain setting can be extra special. New Year of course is a time of great celebration and frivolity and a skiing holiday at Christmas and / or New Year can be really wonderful for couples, groups of friends & families alike. The ski resorts in Colorado really make an extra effort to give you a Christmas and New Year which will be etched on your memory forever. If you're arriving in resort pre-Christmas don't miss the tree lighting ceremony (Vail mid Dec or Breckenridge early Dec) with complimentary hot chocolate and Christmas carols. In Vail family Xmas movies will be shownmid Dec and candy cane handed out at the base areas. Free holiday themed activities in Vail Village & Lionshead Village will be on offer as well as family concerts & Winter Solstice on Ice show leading up to Christmas Eve. In Aspen watch the ice-skating shows, listen to carollers, visit Santa's live reindeer & decorate Christmas cookies. Beaver Creek's Winterfest lasts throughout Christmas & into New Year with Santa's cottage, become Santa's helper and make your own elf hat, Winter characters strolling around Beaver Creek Village, ice skating performances, disco skate night, kids games & winter wonderland parades. On Christmas Eve the excitement is mounting and most of the resorts have an evening celebration leading up to the big day. 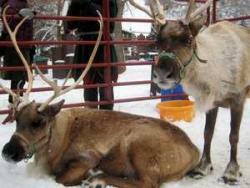 In Winter Park Resort for example the kids can visit Father Christmas in the afternoon and pat his live reindeer. Then nip home and change into your warm gear & boots before heading back to the mountain for the evening, where you arrive to see dancing Christmas trees & Christmas carolers. 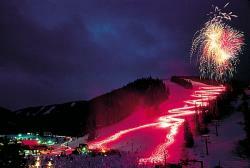 Deer Valley ski resort has a fabulous festive tradition on Dec 30th, with its Torchlight Parade lighting up the slopes. Watch this stunning spectacle with apple cider, hot cocoa & cookies in hand, as the Synchronised ski team parades down Bald Eagle Mountain in fiery formation. Winter Park lines up its ski instructors & ski patrollers for a torchlight descent down the mountain, set to Christmas music. See if they can make it down without falling and enjoy hot chocolate (perhaps with a little peppermint schnapps) around the bonfire while you're watching. Santa Claus may make an appearance on his sleigh and the local's favourite are the dancing snowcats (groomers) lit up with brightly coloured fairy lights. Enjoy a leisurely breakfast or brunch on Christmas morning and stroll around the snowy mountain resort at your own pace. Or if you're up early (or the kids have woken you up early! ), Christmas morning can be a magical time to ski. Whilst others are opening presents you can be whizzing down the slopes avoiding the crowds. 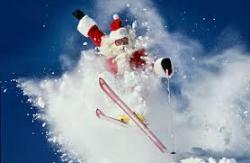 Look out for Father Christmas on skis! A traditional turkey dinner with all the trimmings will be served later on Christmas day in catered chalets. Many of the resorts offer on-mountain dining on Christmas day, so head up the gondola and enjoy a fantastic celebration overlooking the slopes. Note not all restaurants are open in ski resorts on Christmas day, so if you are planning to eat out, make sure you book ahead. 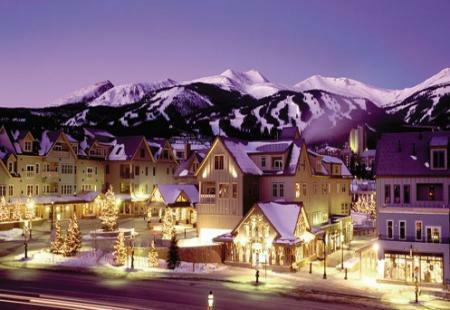 If you'd like to spend New Year in Aspen, be prepared for legendary partying & flowing bubbly! There are so many options to choose from, both affordable & more exclusive. Book ahead for one of Aspen's fine restaurants, before heading to the park to watch the fireworks over Aspen Mountain complete with bonfire & DJ. Later in the evening choose from live bands at Belly up, to DJs at Eric's bar, to chic balls & New Year's Eve galas & dancing at The Regal Watering Hole, Aspen has it all. 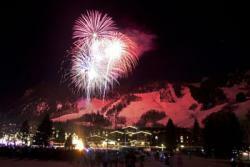 Most of the resorts including Breckenridge & Steamboat Springs have fireworks on New Year's Eve and many have a torchlight parade to boot. After the fireworks in Vail, head up the Eagle Bahn gondola for a family celebration at Adventure Ridge in the evening.. Or if you're more into partying of the adult kind, a huge party will take place with music, dancing and partying. The Dobson Ice Arenais often turned into Vail largest nightclub. At midnight celebrate with Champagne, ball drop & confetti blizzard. Just for fun check out the Chalets USA skiing & snowboarding 12 days of Christmas! !